*Student tickets are available only at the box office, one hour prior to each performance. Students of any institution with valid ID are qualified for the discount. Anyone 17 years old or younger is admitted for free with proof of age. **Season Subscription available for sale up to the first event of each season and not available for students. ONLINE: by following the links above (TicketsWest - Fees apply). $5 STUDENT TICKETS are available for purchase ONLY at the NIGHTINGALE BOX OFFICE. FREE ADMISSION is granted to anyone 17 years old or younger only if availability permits - consult the NIGHTINGALE BOX OFFICE in person one hour prior to each event. 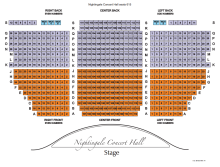 The Nightingale Concert Hall Box Office is located inside the Church Fine Arts Building, in the lobby between the entry doors to the Hall. For ticketed events produced by the Department of Music, the Ticket Office will open one hour prior to each event, both for Will Call and for ticket sales at the door. There are five spaces reserved for wheelchair access. Click the image to enlarge.